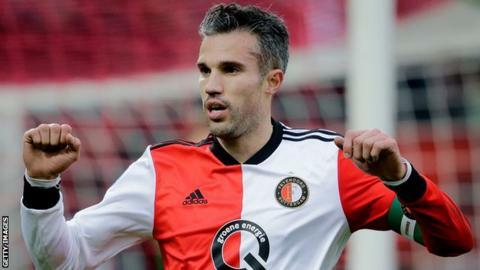 Former Manchester United and Arsenal striker Robin van Persie scored a hat-trick and moved past 200 career league goals in Feyenoord's Eredivisie thrashing of Emmen. Van Persie, 35, who will retire at the end of the season, took his tally to 14 goals this term. Netherlands international winger Steven Berghuis added a fourth for Giovanni van Bronckhorst's side. Feyenoord stay third, 15 points behind leaders PSV Eindhoven. Match ends, Feyenoord 4, FC Emmen 0. Second Half ends, Feyenoord 4, FC Emmen 0. Substitution, Feyenoord. Luis Sinisterra replaces Robin van Persie. Attempt saved. Caner Cavlan (FC Emmen) right footed shot from outside the box is saved in the bottom right corner. Assisted by Andrej Lukic. Attempt saved. Steven Berghuis (Feyenoord) left footed shot from the right side of the box is saved in the bottom right corner. Assisted by Robin van Persie. Delay in match Caner Cavlan (FC Emmen) because of an injury. Attempt saved. Caner Cavlan (FC Emmen) left footed shot from long range on the left is saved in the top right corner. Assisted by Jafar Arias. Attempt missed. Luciano Slagveer (FC Emmen) right footed shot from outside the box is close, but misses to the right following a corner. Corner, FC Emmen. Conceded by Jordy Clasie. Substitution, FC Emmen. Jafar Arias replaces Anco Jansen. Goal! Feyenoord 4, FC Emmen 0. Steven Berghuis (Feyenoord) from a free kick with a left footed shot to the top right corner. Attempt blocked. Keziah Veendorp (FC Emmen) right footed shot from outside the box is blocked. Assisted by Luciano Slagveer. Attempt missed. Luciano Slagveer (FC Emmen) right footed shot from outside the box is too high. Substitution, FC Emmen. Nick Kuipers replaces Nico Neidhart. Foul by Ridgeciano Haps (Feyenoord). Michael Chacón (FC Emmen) wins a free kick on the left wing. Corner, Feyenoord. Conceded by Michael Chacón. Attempt missed. Steven Berghuis (Feyenoord) right footed shot from outside the box is high and wide to the left. Assisted by Sam Larsson. Goal! Feyenoord 3, FC Emmen 0. Robin van Persie (Feyenoord) right footed shot from the right side of the six yard box to the bottom left corner following a corner. Attempt blocked. Jeremiah St. Juste (Feyenoord) header from the centre of the box is blocked. Assisted by Steven Berghuis with a cross. Corner, Feyenoord. Conceded by Nick Bakker. Attempt saved. Robin van Persie (Feyenoord) left footed shot from outside the box is saved in the centre of the goal. Assisted by Nicolai Jørgensen. Corner, Feyenoord. Conceded by Stef Gronsveld. Attempt blocked. Robin van Persie (Feyenoord) left footed shot from outside the box is blocked.